Standard - $44.99 Only 7 left! X-Large - $44.99 Only 6 left! If you're a loyal citizen of the Empire in the Star Wars galaxy, it's usually best to cooperate and not cause a fuss when you see stromtroopers on patrol. But if shadow troopers show up on the scene, you'd better take cover, because they aren't there to play nice! Now you can join the ranks of these mysterious new baddies featured in the movie Star Wars: Rogue One, with this official Shadow Trooper Costume, and crush some rebel scum! Not much is known about these sinister looking foot soldiers, but secrecy is probably a big part of their job description. Shadow troopers look well equipped for special operations requiring very particular skills and capabilities. Maybe their suits are designed for sneaking around in, since their black armor plates look sleek and stealthy. Their uniforms also resemble the outfit of a certain Dark Lord of the Sith, especially the angular face plates of their helmets and the distinct belt buckles. Could these guys be the personal shadowy minions of Lord Vader, himself? We can't wait to find out! We won't ask you what your mission is when you're in this intimidating costume; we'll just know you're up to something big and get out of your way. 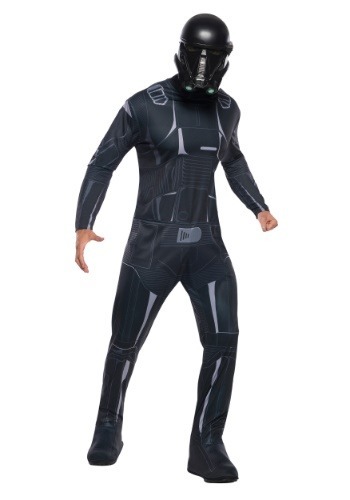 The polyester bodysuit is printed with black armor panels and details to look just like the troopers' uniforms in the Rogue One movie, while the molded plastic helmet mask features mesh eye covers, to help you see during covert operations. The Rebellion won't stand a chance!